February 28, 2017 was probably my favorite NYAPRS Legislative Day ever. New York Association of Psychiatric Rehabilitation Services is a 35-year-old organization that brings together mental health recipients and recipient-friendly service providers. Mental health advocacy has come a long way. We are finally getting the respect we deserve. The folks in attendance heard from Senator Robert Ortt, Assemblywoman Aileen Gunther, a representative from Governor Cuomo’s office, and a representative from the Office of Mental Health. We also gave out awards, including an award to Senator Jeffrion Aubry for his work on criminal justice issues. New York City folks accounted for about 360 of the 700 people in Albany that day. NYAPRS statewide folks filled a large auditorium called The Egg, which is shaped like an egg. Funding to shore-up existing housing; Funding for new supportive housing and affordable housing; Raising the age for adult criminal responsibility to 18 years of age; Ending solitary confinement, the SHU, once and for all; More funding for comprehensive 36-hour police training around mental health called CIT (Crisis Intervention Team) training; and Opposition to Forced Treatment. 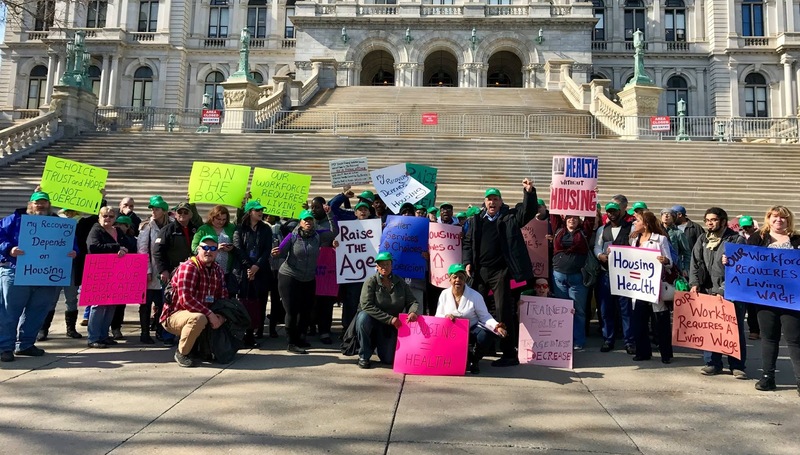 I was so excited this year because I got an old-style physical banner created, which read “Supportive housing saves lives, sign the MOU.” The MOU, memorandum of understanding, is a simple contract that the leaders of the NYS Senate, Assembly, and Government must all sign together. If they sign the MOU, $1.9 billion in housing funding gets released, creating 6,000 apartments. If they don’t sign the MOU, the money cannot be released for housing providers and new apartments will be much more difficult to build. I had some NYAPRS helpers hold up the banner when I spoke about housing on stage, and I carried the banner all around the NYS Capitol. I got some thumbs up signs from elected officials’ staffers, and a few snarls from NYS Security officers. After listening to Harvey talk about the issues and hearing from some officials, some people went to a rally on the Capitol steps outside. Those attendees carried signs they made at home that read with slogans like “Ban the Box,” and, “There is no health care without housing,” etc. Other attendees went into the Capitol and Legislative Office Building to visit with key elected officials. I lead a team to visit some elected officials. My group spoke elegantly about all issues, but focused on housing and opposition to forced treatment. My group of attendees blew me away with how well they spoke. They were some of the most impressive advocates I’ve ever had the pleasure to help coordinate. Now I am getting ready for the NYC Mental Health Film Festival. We are meeting as a group and screening films to see if the films are worth showing at our film fest. If you want to join us, contact me, Carla Rabinowitz, crabinowitz@communityaccess.org or 212-780-1400 x7726.